Els grew up in the Northeast and attended Middlebury College. While there, she studied literature, history and art and was an All-American soccer player. After school, Els headed to Montana, where she juggled collegiate soccer coaching with day jobs in environmental conservation and renewable energy, all while exercising her love of running and biking trails, fly fishing teeming trout rivers, and gliding on skinny skis across fluffy snow. After living it up out West for most of their 20s, Els and her husband Simon moved home to Vermont. 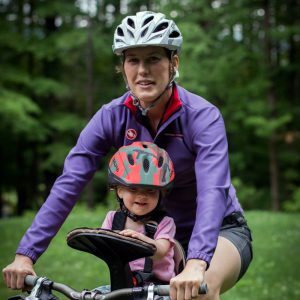 Recently, Els earned her Masters in Environmental Policy and Law, coached college soccer at her alma mater Middlebury, worked in solar and on her own ecologically-friendly art venture, and welcomed a wonderful human named Pippa to the world. These days, Els and little Pippa can be found gardening, fly fishing, mama-toddler tandem biking or otherwise exploring life together (and on the best days Simon and their four well-behaved dogs get to join too)! Opportunities to be athletic, especially through adventure sports, have been among the biggest gifts I’ve received in life. My parents raised me in the "church of the Great Outdoors,” which meant that my sister and I were exposed to big adventures biking, hiking, camping and climbing from an early age. I dove deep into mountain biking after college when I lived in Montana and had 100+ miles of single track trails out my door. The sport has given me many gifts, among them the opportunity to explore new places and adopt a more present mindset. It probably gets said a lot, but if Little Bellas had been around when I was a kid, I would have been clamoring for my parents to sign me up. And, now a mother of a daughter, I can’t wait to sign Pippa up as soon as she is old enough. Why Little Bellas? Because I know the toughness that muddy trails can teach, and how a feeling of capability borne from climbing a hill can serve a person wherever they go in life. The more girls we can get on bikes who get this experience this too, the better! To double the length of a day! Favorite color? A light limey green color! Favorite food? Fruit. Mediterranean food. An almond milk latte with a salted caramel French macaron on the side. Hidden talents? I used to be able to do an advanced country/folk dancing move called the Wagon Wheel where I would spin my lower leg around so fast in a circle that it would look like a wheel. It was a big hit at dance parties. However, my knee flexibility has apparently faded, because I’ve been told it’s not as impressive now as it once was. What is your favorite Little Bellas experience? Other than having had the privilege of watching Little Bellas grow from an idea hatched by two amazing college pals to a national organization touching the lives of thousands of girls and families, my favorite experience has been joining the Little Bellas team, getting to meet the awesome girls and mentors, and getting to call helping get more girls on bikes a job! What is a fun fact that people don't know? I am in love with berry picking! I build my summer schedule around when strawberries, blueberries and raspberries are in season and get really (overly) excited talking about it!